This is the best apple cake recipe ever! 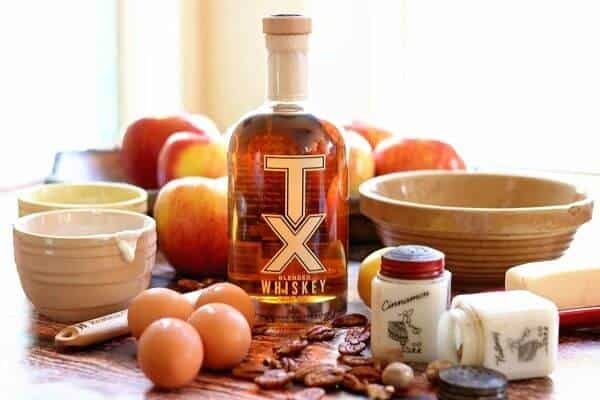 Chunks of tangy apples are stirred into a spice cake batter along with buttery pecans and a generous amount of whiskey. It bakes in a bundt pan for about 50 minutes, during which time your entire house will smell like fall. After it comes out of the oven it’s brushed with a whiskey glaze and then cooled. Meanwhile your family will be gathering in the kitchen, forks in hand. It’s that good. But wait! There’s more! Serve the thick, moist slices of cake with a drizzle of homemade whiskey caramel sauce for what is now you’re family’s favorite cake. F&R Distilling has partnered with Restless Chipotle to bring you this sponsored post. I am so VERY excited to be working with Firestone & Robertson Distilling Co on this project! Y’all know I love working with Texas companies AND this is a product I’ve used for years because I just love the sweet, smokiness of the whiskey. When they invited me to the distillery for a tour I cleared my calendar faster than a Southern boy cleaning up a plate of biscuits and gravy. I have 5 boys. I know just how fast that is. I’m going to be sharing about that tour with you later on – you can probably look for it in January when my life calms down – if it ever does. But the real takeaway here is that they asked me to come up with a recipe that showed off the flavor of the TX whiskey and honestly it didn’t take me long to figure out what I was going to do. I’ve had this recipe marked from one of my older cookbooks (1931) for a really long time. I kept meaning to make it over for y’all but it never seemed like the right time — until now. So the original recipe doesn’t call for whiskey or whiskey glaze but its impossible to imagine this sweet apple cake without that smoky flavor to balance it. The glaze adds more flavor as well as helping to keep the cake moist. I think this is one of my best adaptions – be sure to give it a try and see if you don’t agree. The tops of the corks at Firestone and Robertson Distillery Co are made with leather from boots and each is unique! Texans are a proud bunch but we have our reasons. For most of us the desire to be the best is something we soaked up in the womb. It didn’t surprise me to hear that F&R Distilling Co. TX Whiskey took home the award for “Best American Craft Whiskey” as well as the “Double Gold” award at the 13th Annual World Spirits Competition. There were a total of 1,407 spirits from 63 countries and the TX Whiskey won. Just let that sink in a minute or three. Ok, I was tempted to write “Yummy” and leave it at that but I figured y’all wanted a better description. I think it’s smooth and slightly smokey, with caramel coffee in the finish. So, I thought this was the coolest thing ever. 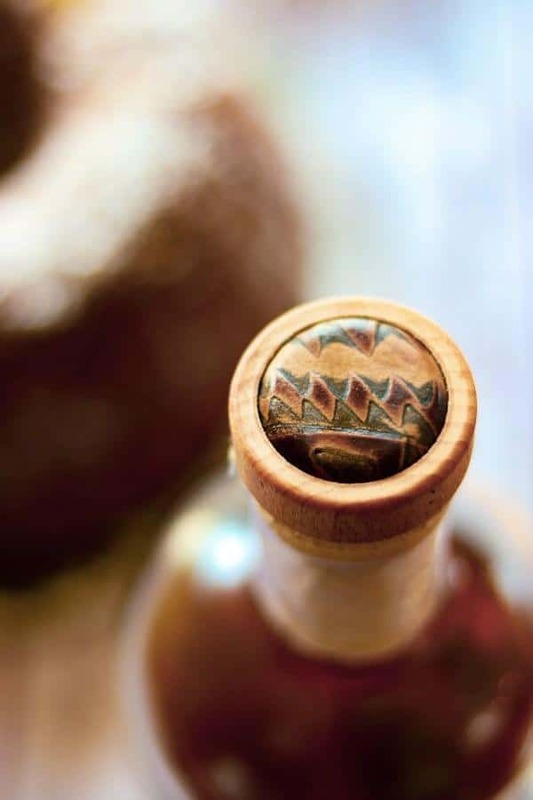 If you look carefully at the top of the cork on each bottle you’ll see patterned leather… and each one is unique. That’s because the leather tops are made with boot leather scraps from boots! Lawd, how Texan is that? You can even bring an old pair of boots in and have a top made just for you. 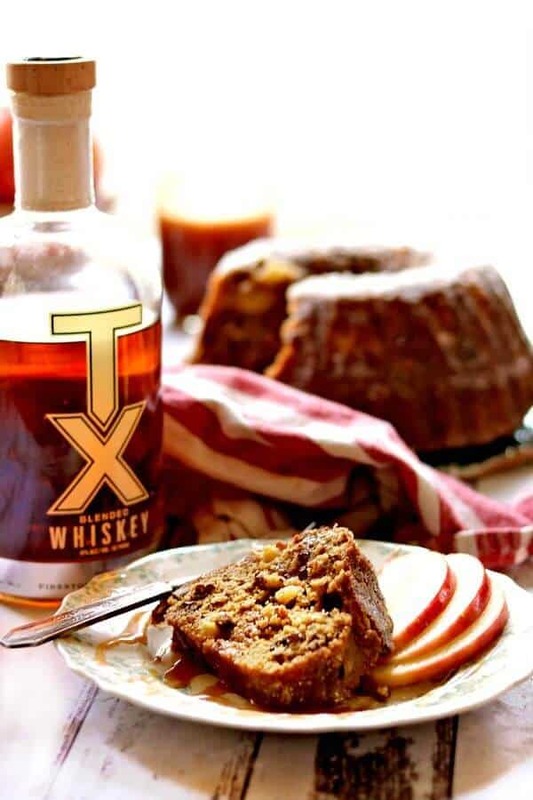 Award winning TX Whiskey from Firestone & Robertson Distilling Co gives this unique bundt cake its flavor. 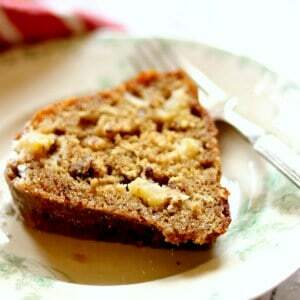 This apple spice cake recipe is so good – and it’s so easy! Here are some cook’s notes that may be of interest to you. What kind of apples to use in a cake? You may have different varieties available where you are – try different apples and in different combinations to see what you like best. How do you make a moist apple cake? 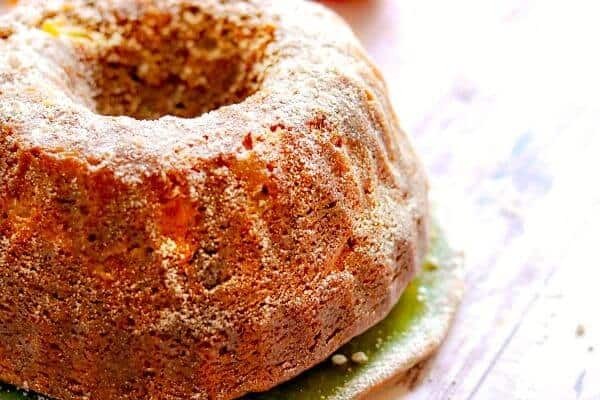 This spicy bundt cake stays moist because of the combination of diced and grated apple as well as the whiskey glaze on the surface of the baked cake. Can I substitute for the whiskey? If you need to substitute for the whiskey in this cake (and I hope you don’t) you can use the same amount of apple cider. This apple cake stays moist and delicious thanks to the whiskey glaze. 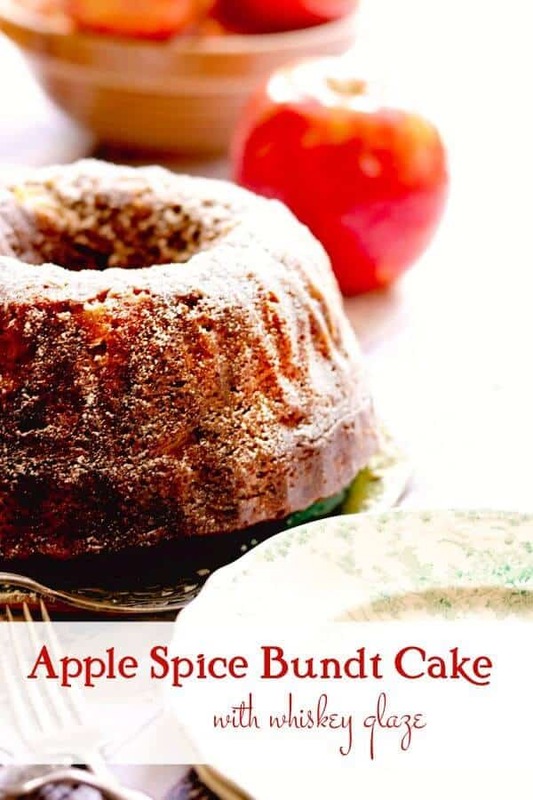 My apple spice bundt cake recipe calls for both diced apples AND grated apples. This gives more apple flavor. Don’t add more grated apple than called for in the recipe though or the batter will be too wet. Spray a 12 cup bundt pan with baking release spray, or butter and flour it. Combine the ingredients according to the instructions in the recipe. Grate the apples and stir them in. Add the batter to the prepared bundt pan. Bake 50 minutes or until a toothpick inserted in the middle of the cake comes out clean with just a few moist crumbs clinging to it. Prepare the glaze while the cake is baking. Carefully run a knife around the edge of the cake to loosen it from the pan. Turn the pan upside down and ease the cake out. Brush with the glaze while still warm. Oh y’all. Did you really think this apple cake was the only boozy recipe I had on the blog? You know me so much better than that. You can substitute whiskey for bourbon in any of these recipes, by the way. This easy apple bundt cake is perfect for Thanksgiving, Christmas, or just a celebration of fall! It freezes well for up to 3 months so you can make it ahead of time or store it, tightly covered, at room temperature for up to 4 days. Looking for a layer cake? Try my spice cake with maple cream cheese frosting! If you love this cake please give it 5 stars. Sweet and spicy, this apple bundt cake has all the flavors of fall. The combination of fresh apples and whiskey glaze keeps it moist for days – if it lasts that long. Tastes best the second day. Dust with Confectioner’s sugar and drizzle with some caramel syrup before serving, if desired. Bake until the cake is golden brown and a skewer inserted into the cake comes out dry – about 60 minutes – start checking at 50 minutes. Hi. Thank you for clarifying the cloves in the ingredient list. I made the cake, and it was awesome!